Chartism would have been a hot topic for political debate when the following first-hand accounts of Chartist meetings at Mansfield were written in his diary by William Moss of Leeming Street in Mansfield in 1842**. 21 February 1842: A great Chartist meeting in Nottingham Market Place. Hundreds are gone from Mansfield and Sutton [-in-Ashfield] with flags and a band of music. Feargus O'Connor is to be the chief speaker. 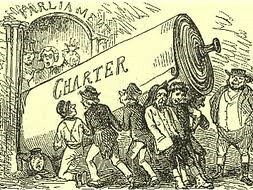 27 July 1842: A grand day for the Chartists. Their demi-god, Feargus O'Connor, has been visiting them here [Mansfield] and making a speech in the Market Place. Numbers of them began to assemble in the forenoon between nine and ten, with two bands of music and a great number of flags of all sorts and sizes; and they proceeded to Robin Down's Hill to meet the man as he had been speechifying at Calverton yesterday. They thought of being back to the Market Place by 12 o'clock but it was nearer 2 when they came. Feargus addressed them from a stage which they had erected, and then - to his shame be it spoken - Mr. Thacker took him to his house to dine. [NB Mr Thacker was a printer in Church Street, Mansfield]. 17 August 1842: Some Chartists, with a youth of the name of Dutton at their head were about holding a meeting in the Market Place. They had brought a cart, and some of the leaders amongst them had mounted, and Mr Dutton was about to read an extract from the Northern Star (the most wicked and blasphemous paper published) concerning the doings at Manchester when Colonel Wildman and four of our magistrates went up and dispersed them. It seems however they were determined to meet, so they went up into the Lawn, but the magistrates heard of them, sent constables to take Dutton their chairman into custody, and bound him over to keep the peace for six months. 22 August 1842: The town has been very much agitated throughout the day. Many have been expecting the Chartists coming in a body from Sutton [-in-Ashfield] and Alfreton and the neighbourhood to create a disturbance here. Hitherto, however, their expectations have not been realised. This page was added by Website Administrator on 16/05/2018.